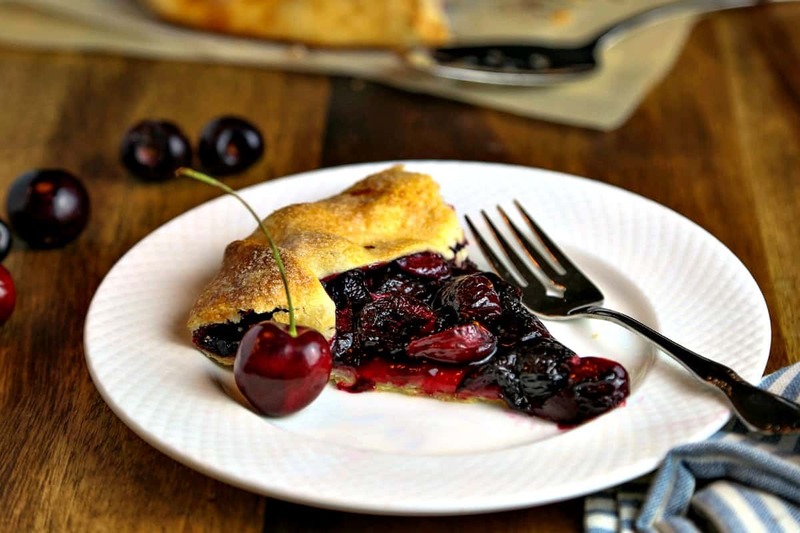 Bake fresh cherry filling on top of this easy 5-minute pie dough and you’ve got yourself a delicious Summer dessert that any novice baker can master—Rustic Cherry Tart. I’m in love with Summer fruit pies, especially free-form rustic tarts. You can make them with homemade or refrigerated pie dough and there’s no fuss trying to fit the crust into a pie pan or worry about making perfectly crimped edges. 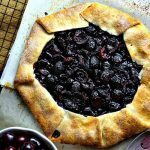 With this Rustic Cherry Tart, you simply roll out the dough, layer on the filling, and fold the dough over the fruit and bake. Truly, it is easy as pie! Don’t take it serious; it’s too mysterious! You don’t have to be a pastry chef or expert at forming perfect pie crusts because the free-form crust is what makes this tart rustic—and charming, too, right? Fresh fruit and a buttery crust—how can you beat that? 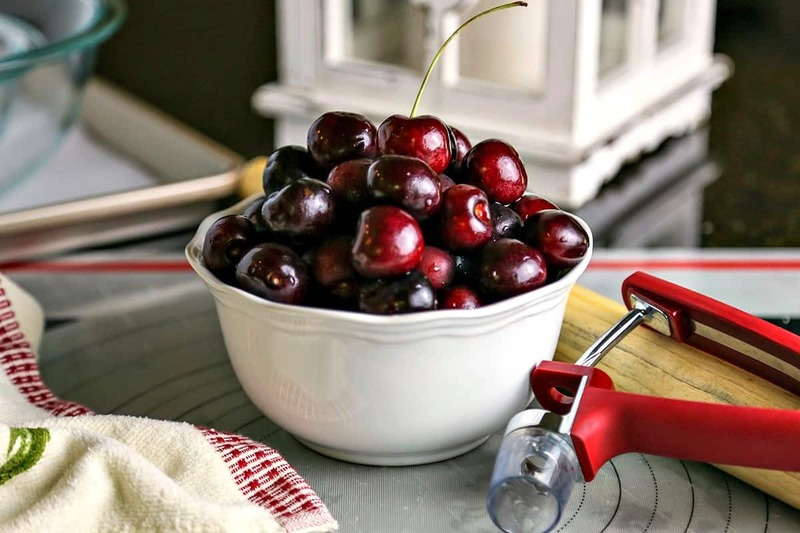 Creating a tart does take a little effort, but it’s really easy with the right kitchen tools—a food processor for prepping my favorite pie crust and this OXO Cherry pitter. The filling for the tart is simply a bowl of cherries coated with sugar, a little cornstarch to bind the filling together, and a squeeze of lemon juice to keep the fruit from being too juicy, thus avoiding a soggy pie crust. Like I said, you could make this tart with a store-bought refrigerated pie dough, but making it fresh is really so much better. I love that this crust is mixed in a food processor and then dumped into a large zip lock bag and chilled. By placing the dough in the bag, you can squeeze it into a disc without getting messy hands—no fuss and no mess! After it chills, roll the dough into a large circle on parchment paper, layer with fruit, and bake. Try making this tart with other fruit, like peaches, blueberries, or apples. Enjoy! 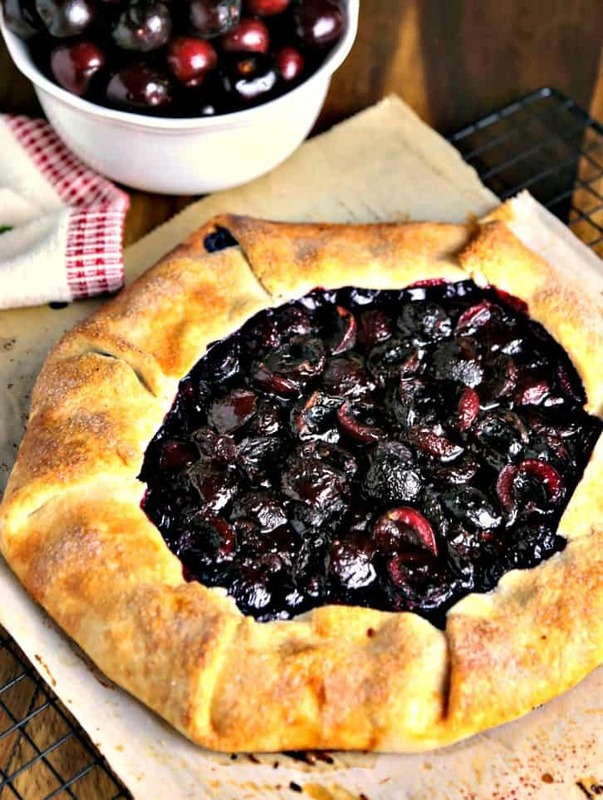 DID YOU MAKE THIS RUSTIC CHERRY TART RECIPE? 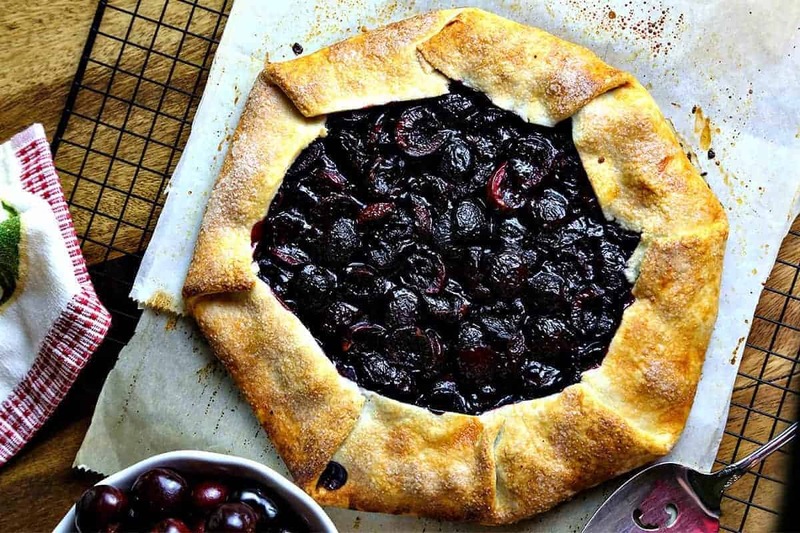 Bake fresh cherry filling on top of this easy 5-minute pie dough and you’ve got yourself a delicious Summer dessert that any novice baker can master. Roll the dough out onto a lightly floured piece of parchment paper, into a 14 inch circle. Transfer the parchment and dough onto a baking sheet. Pit and slice the cherries in half. Place in a large bowl and toss with the 1/3 cup sugar, the cornstarch and lemon juice until evenly coated. Pour fruit onto the center of the dough and spread out to within 2 inches of the edge. Fold up the edges over the fruit. Make an egg wash by whisking together the egg white and 1/2 teaspoon water with a fork. Brush the pastry with the egg wash and sprinkle evenly with 1/2 tablespoon sugar. Bake at 375 degrees for 1 hour, or until filling is bubbly and crust is golden brown. Cool completely before slicing. Place flour, salt, and sugar into a food processor and pulse a few times until blended. Sprinkle the butter over the top and pulse just until the butter is slightly broken into the flour but still in visible pieces. Sprinkle the ice water over the flour mixture and process just until the mixture starts to come together. Dump the dough into a gallon-size lock-top plastic bag, and press into a flat disk. Refrigerate for 30-60 minutes before rolling out the tart. Original recipe from Warm Vanilla Sugar. i love cherries. it looks so good! Thanks, Dina. Let me know if you try this recipe and come back here to rate it, too! Happy 4th! 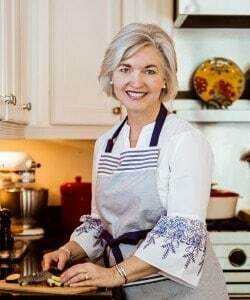 Linda, I’m planning on freezing some cherries this week (while they are still on sale) and am planning on using them for tarts later as well. I haven’t tried the recipe with frozen cherries yet, but I would plan to drain the cherries after they thaw to remove any excess liquid. If you do try it, please let me know how it works for you. Enjoy and Happy 4th! My plans are for over the weekend too. Just love how simple and wholesome this recipe is. Just doesn’t get any better! Happy 4th and Happy Cooking!! We made this yesterday with fresh yellow and red cherries that we picked the same day. It was incredible!!! We used Dufour Pastry Dough instead of making from scratch – but followed your filling recipe. My husband said its the best thing I’ve ever cooked. 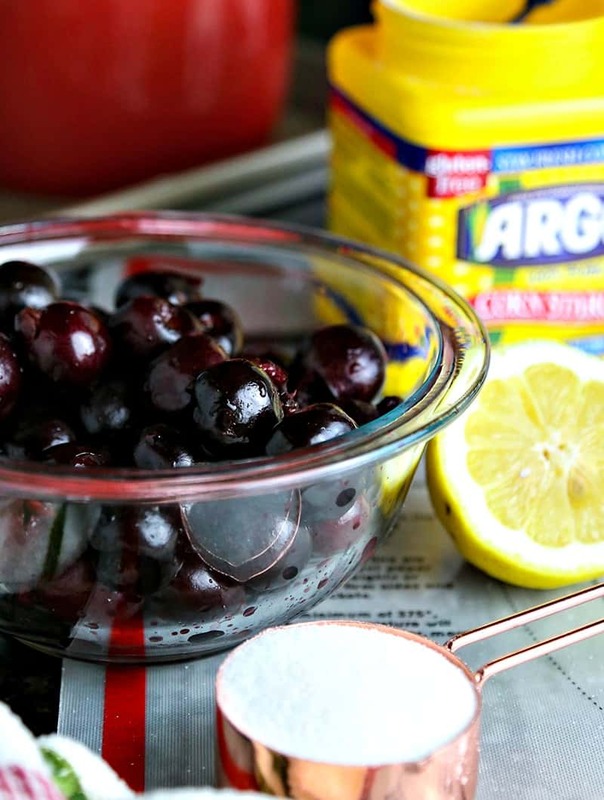 It was also so easy to make and so simple that the cherries were highlighted when eating. 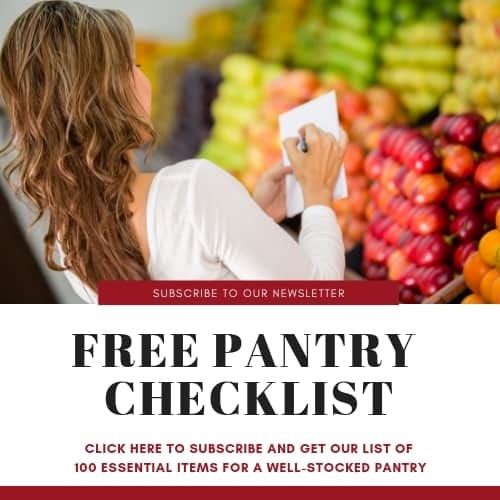 Thanks for the recipe – we will be making this again! Lauren, soooo very glad you enjoyed the recipe! Cherry pie with fresh cherries really is the best!